We offer various services – Invisalign, Crowns, Bridges, Dentures/Partials, Teeth Whitening, Veneers, Preventive Dentistry, Gum Treatments, Extractions, Sealants, White Fillings, Space Maintainers, Fluoride Treatments and much more. Visit the ADA Patient Education site for more information to take care of your teeth and health, provided by Dalal Dental Care. Take a look at dental patient education videos to view dental procedures. At Dalal Dental Care, we offer an extensive range of dental services for all ages – Invisalign, Crowns, Bridges, Dentures/Partials, Teeth Whitening, Veneers, Preventive Dentistry, Gum Treatments, Extractions, Sealants, White Fillings, Space Maintainers, Fluoride Treatments and much more. Invisalign is the clear way to straighten the teeth without braces, using aligners. Aligners are removable and virtually invisible. If your teeth are discolored, tooth whitening may help. “Whitening” is any process that can make teeth look whiter. A denture is a removable replacement for missing teeth and surrounding tissues. There are two types of dentures - complete and partial dentures. A dental crown is a tooth-shaped "cap" that is placed over a tooth to restore its shape and size, strength, and improve its appearance. Dr. Dalal takes excellent care of her patients. She is great at figuring out problem areas and advising on proactively solving them before they become acute. I'd highly recommend Dr Dalal's expertise for dental care. My parents and I have been going to Dr. Alpa for a number of years now. Dr. Alpa is absolutely kindest, knowledgeable and friendly dentist ever. She makes you feel as ease as she performs any dental need. Front desk staff is also very friendly. Very clean office with new equipment. It always has been amazing experience every time we go!! Dalal dental is one of the few clinics that accepts Medical in Pleasanton. My daughter got a lot of work done there recently. Dr. Dalal is very friendly and patient, answering questions in detail. She was also very considerate when my daughter was in pain and scheduled her immediately. All the work was done very efficiently and painlessly. Her assistant Mandeep always greets everyone with a smile and is very helpful. The clinic is clean and well maintained. The appointments are well organized and we never had to wait more than a minute in the waiting room. I would recommend Dalal Dental to all cavity prone netizens. I've recently become a patient of Dr. Dalal and I am very happy with my experience. I scheduled an appointment over the phone and saw her the following week where I got a cleaning after almost two years! She let me know I was gonna need some fillings and we scheduled for the following week. She answered any questions I had and was very reassuring of any concerns I had. She also asked if my toddler had seen a dentist and I told her not yet so we scheduled her a first check up appointment. My toddler was a bit reluctant in opening her mouth but Dr. Dalal was very patient and played Peppa pig at the dentist for her which helped ease her nerves. I have scheduled my next routine clean up for six months from now and my toddlers as well. 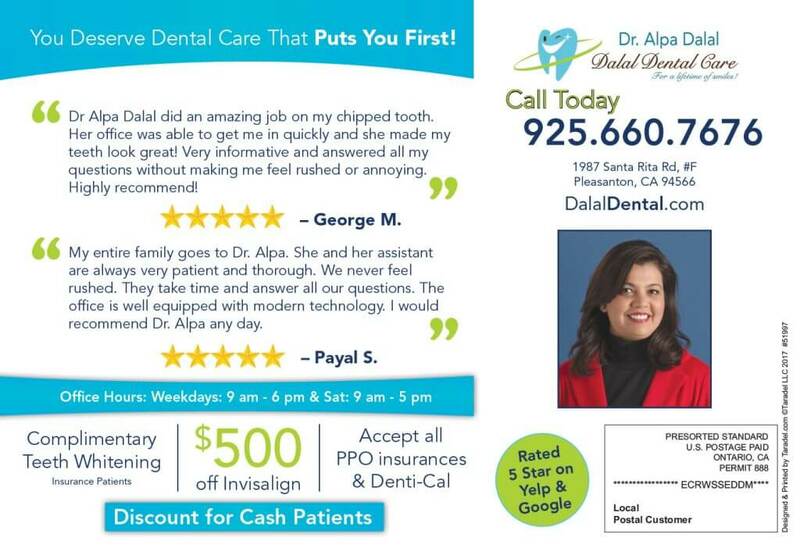 Dr. Alpa Dalal has been my and my family's dentist since past 5 years. She is a very patient, calm and has smooth hands. I and my family couldn't have been happier than having Dr Dalal as our family dentist. It's very easy to get an appointment with flexible hours of operation during weekends too. She deserves five star rating! Dr. Dalal and her team are very dedicated, caring and professional. We felt no physical discomfort and commercial pressure throughout all dental services and treatments they provided for us. We'll send our young children to her at a late time too. Me and my younger brother have recently become patients at Dalal Dental care. - Mandeep is very welcoming at the front desk, she is also very helpful and gentle when it comes to assisting Dr. Dalal whether it be taking x-rays, teeth cleaning etc. I went in for deep cleaning. When I called to schedule my appointment they were friendly and very accommodating of my schedule. Dr. Alpa is extremely gentle, very personable, and professional. The level of care and concern is genuine. She explained the procedure that I was nervous about and eased my mind. The office is clean and modern. Easy parking just outside the office. Definitely 5 stars! We went to Dr. Dalal's office as DentiCal patients. Making the appointments was easy and convienient. We were greeted and welcomed by the front desk woman named Mandeep. She also helped us with paperwork and took our X-rays. She could not have been helpful or patient. 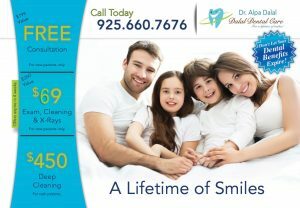 Dr. Dalal did our exams and cleanings and was so gentle and thorough. She was also very informative and gave us great ideas for help with tooth grinding and how to keep our teeth extra clean in between cleanings. I honestly believe that this office was the most pleasant one I've ever experienced. And it was also very modern with a very comfortable waiting area. I highly recommend this dental office to anyone who wants a great dental experience. Dr Alpa has very steady hands. She explains things very well. I am very satisfied with recent visits for cleaning my teeth and filling cavities. The clinic staff is prompt and friendly. My entire family goes to Dr. Alpa. She and her assistant are always very patient and thorough. We never feel rushed. They take time and answer all our questions. The office is well equipped with modern technology. I would recommend Dr. Alpa any day. The thing I like most about Dalal Dental Care is its welcoming, friendly and professional environment. Dr. Alpa took time to explain and answer all my questions with great attention. Kudos and the highest recommendation to Dr. Alpa and everyone at Dalal Dental Care. Your referral of a friend or a family member is a great compliment we can receive. We’ll work to give them a smile as bright as yours, and you’ll receive a special thank you gift ($20 Amazon or $20 Starbucks). As a valued patient of our practice, our team strives to earn your referrals by providing the most exceptional dental care service. (Referral program valid for PPO insurance patients only). For your convenience, our New Patient Forms are available for download here in Adobe Acrobat PDF format. Please print and complete these forms at home before your first appointment. You may also download the forms and type in. If you need assistance with downloading or printing these forms, please contact our office. © 2016 Dalal Dental Care. All Rights Reserved.